March and April are usually challenging months for rose growers. After Women's Day (March 8) it takes a while for the next big holiday to arrive. At the moment, the demand for roses - particularly the red ones - is low. This, combined with the good production from Kenya and Ethiopia, results in low prices on the clock, which in turn leaves several growers throwing away a large part of the production of reds at their farms. They eagerly await Mother’s Day season to get out of the doldrums. Bert Middelkoop next to a vase of Solsy. Zuurbier, for example, who grows roses in Naivasha, Kenya and sells them direct and through the Royal FloraHolland auction, currently throws away 75 percent of the production of red roses already at their farm. 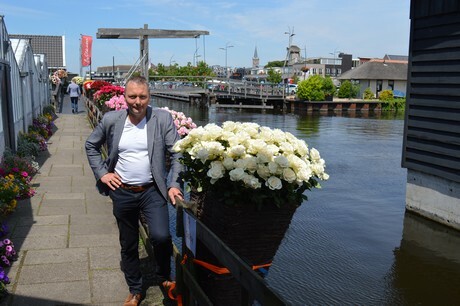 "The prices at the auction are so low that it is not worthwhile to ship the flowers", says Bert Middelkoop, Sales Manager, at Zuurbier. The assortment of Zuurbier ranges from 40 to 70 cm roses in several colors, and red is the color that is hit the hardest. "For red, all sizes aren't doing well on the clock. Also the colors pink and cerise are under pressure. The only ones that are currently being sold are yellow, white and orange. These are colors for the Easter season." Red Torch (red), Babyface (rose) and Fuchsia (cerise). According to Middelkoop, the primary reason for the low prices is the low demand. "Tulips and other bulb flowers are hot during this time of the year." And the increased volumes of roses on the market only seem to make it worse. "Over the last month, the weather has been good for producing roses. Usually during this time of the year, it is the start of the rain season, but it is a bit late this year. Therefore, the production is higher. On top of that, the production at many farms who flushed for Valentine's Day is higher as the flush usually returns during this time. This in turn forces them to throw away their roses as well. Fortunately, we do not 'flush' our crop for Valentine's Day that heavily, so the volumes that we have to throw away are probably less than many other growers who drastically increased their production for Valentine's Day", says Middelkoop. Unfortunately, the prices for UK Mother's Day were not good either this year and according to Middelkoop, this mainly had to do with the date of the holiday. This year, the holiday fell late in March (on March 31) and when it falls late, prices seem to be low always. "When it falls closer to Women's Day, celebrated on March 8, the demand for roses is high, so the prices for roses in general are higher." Middelkoop expects the prices to increase by the end of April. "On April 23, Sant Jordi will be celebrated in Catalonia, Spain, which usually revives the sales of the long reds a bit." Afterwards, in May, several Mother's Days will be celebrated on different dates across Europe; the majority of the European countries celebrate Mother's Day on May 13 this year, but in Spain, Portugal and Romania, it falls on May 5, and in France and Poland on May 26 this year. "In Poland, they mostly demand red roses, but for all other EU countries, all colors and all lengths are usually doing well." The low prices on the clock are a hot topic at the moment and Middelkoop therefore predicts that it will be the talk of town at the Rose Show that will be held at the Keukenhof (in the Netherlands) tomorrow. At this show, several breeders and growers will meet and present their roses to the visitors of the Keukenhof. Another event that is all about rose s is ROOOZ. Over the last years, Zuurbier together with other growers organized this event, which is aimed to be interesting for the entire chain - from breeder to consumer. Last year, it was a 4-day event (held in June) where roses from the growers and from different breeders were on display and several lectures were given. In 2019, ROOOZ will be skipped, but in 2020 another edition might be organized; ROOOZ 2.0.